One of the favorite anime and manga in the early- to mid-90s is a series called Sailor Moon. It’s a series that tells the story of a middle-school teen named Usagi Tsukino to fight evil via given powers. But for this article, we’ll be talking about one of the series’ main characters in Tsukino Chibiusa. Chibiusa is the daughter of the Neo-Queen Serenity and King Endymion. She is also the crowned princess of Earth in the 30th century who traveled to the past and seek help from the Sailor Soldiers. Her real name is Tsukino Usagi, similar to the name of the series’ protagonist and who is also the mother of Chibiusa. Like her mother, Chibiusa is also a sailor soldier that transforms into Sailor Chibi Moon. Dressing up as her sailor persona is not complicated, because the superhero wears school uniform. This article will be a Tsukino Chibiusa cosplay guide. Tsukino Chibiusa is one of the main characters of the Sailor Moon series. Her real name is Tsukino Usagi, similar to that of her mother, Neo-Queen Serenity (the original name and title of the main character Tsukino Usagi). She used the name Chibiusa to avoid confusion with the present day Usagi. Cosplaying this character usually means dressing up as her Sailor Chibi Moon persona. 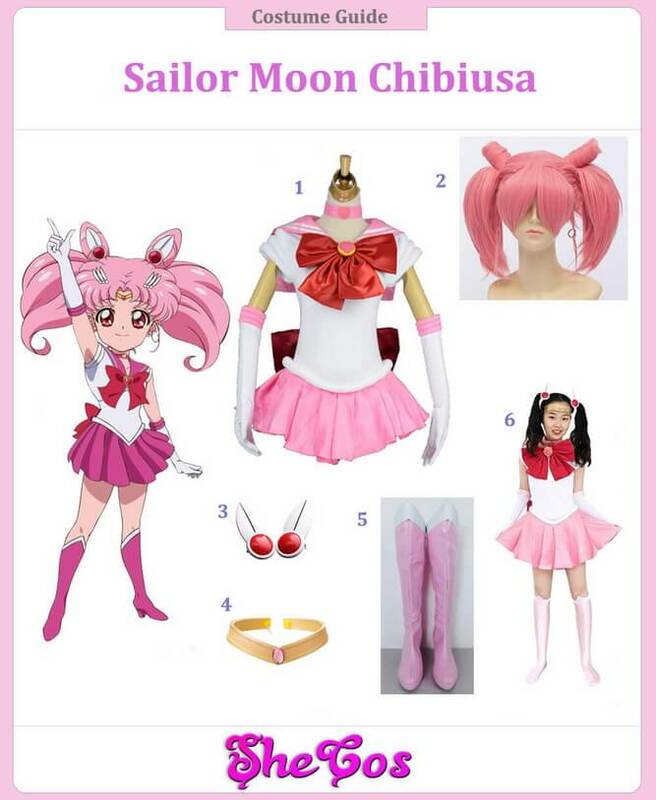 This Chibiusa cosplay set comes with a full Sailor Chibi Moon costume, which includes both the dress and accessories. The dress is a white sailor school uniform with a pink collar and a pink mini skirt. The dress comes with a red bow at the front and the back. The set also has elbow-length white gloves with pink bands on the elbow and knee-length pink boots. The cosplay set comes with a rabbit ear-like hairpin, headband headwear and a pink wig with Chibiusa’s hairstyle. Tsukino Chibiusa is one of the main characters introduced late in the series. She made her first appearance after the Sailor Soldiers defeated the Dark Kingdom. She has the appearance of a 5-year-old girl but possesses intellect and maturity that is not ordinarily present from kids that age. Stated in the manga, she is more than 900-years-old, which explains her intelligence, maturity, and wisdom despite her kid-like appearance. 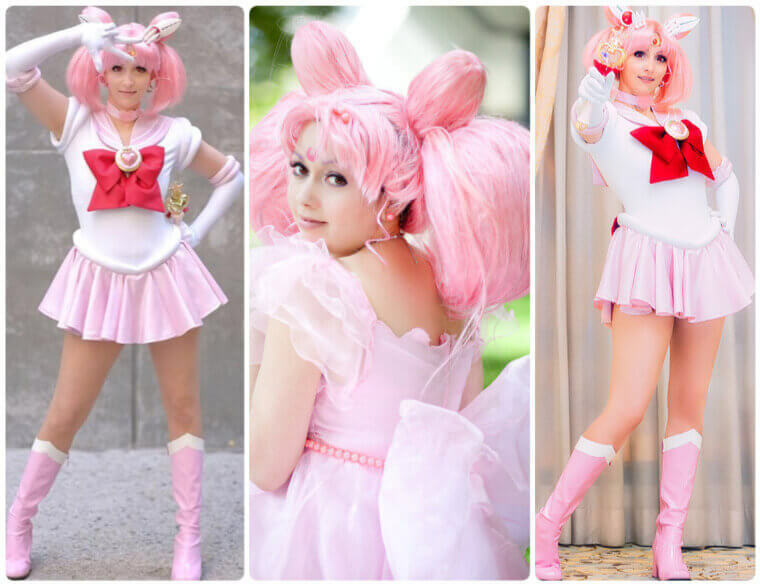 Despite looking like a kid, cosplay Chibi Moon is not limited to kids. 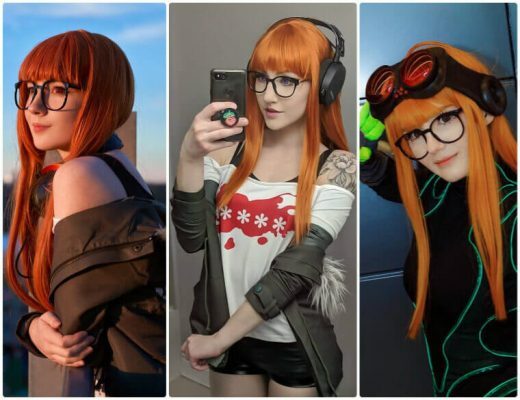 There are also a lot of ladies who choose to dress up like the character for costume parties or comic conventions. 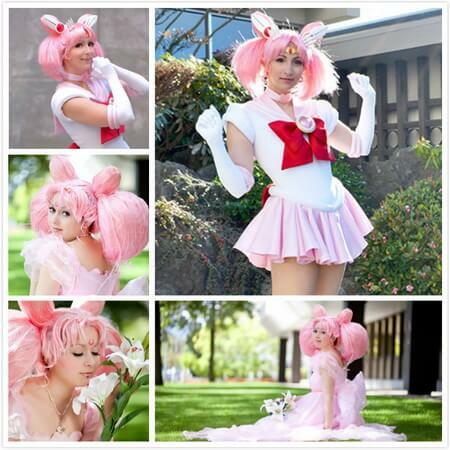 Looking at the Chibiusa cosplay photos, you can see that you don’t need to be a kid to dress up like the character. Adult ladies can also pull off the look of Chibiusa and look good doing so. It's a good idea to get the full Sailor Chibi Moon Kids' outfit for family cosplay with your children.